Each August Twickenham recruits a new placement student for the year and last August we were lucky enough to have Abi Watson join the Twickenham team. Sadly the time has come for Abi to leave us and return to uni for her third year, but before Abi left us we asked her some questions about her time with us. 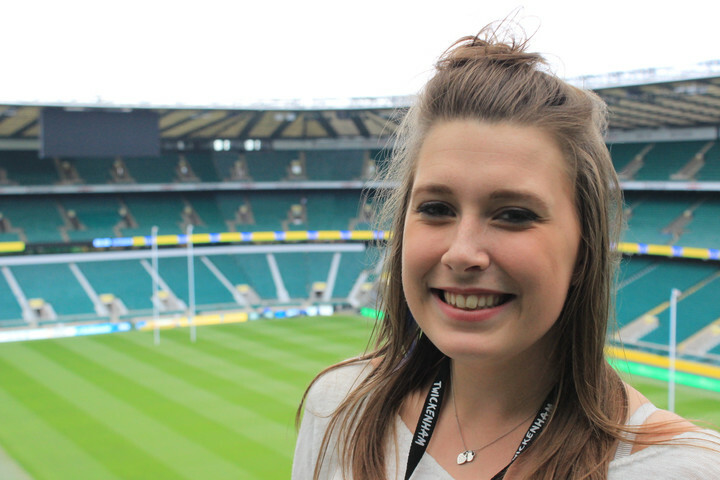 Start by telling us what your placement at Twickenham involved… To be honest, my placement involved taking part in a bit of everything. Experiencing almost everything employment at Twickenham had to offer. One week I would be working with finance preparing the Cash Office for a match day, the next I was cheffing in the kitchen over a match week, from the sorting of a mountain of broccoli to the service of exquisite meals. I have worked most shift patterns, adjusting to the work hours required for each department and have embraced working with each new team of colleagues. Each experience was so varied which meant that I gained an amazing oversight in to how the whole company operates. I have worked at least two weeks with each of the 11 departments over the year that I have spent at Twickenham which allowed me to understand what each department did on a day to day basis and how they would prepare for major events or the Conference & Events side of the business. I was also very lucky to attend off site opportunities for events at other premises, researching competitors, viewing sites and attending an awards ceremony. What has been your best memory at Twickenham? One of my favourite memories of my time at Twickenham was working the NFL and looking after the LA Rams Cheerleaders and the National Anthem Singers. This was good fun to see the talent side of a major event. Whilst challenging to keep up with the demands of some acts, this added to the experience and I learnt so much about dealing with celebrities. Seeing the Home of England Rugby transformed into an American Football environment was insane as they completely rebranded the whole stadium. What's the most valuable thing you've learned? One of the most valuable things I have learned during my time at Twickenham is to throw yourself into everything. Grasp every opportunity hands on and from this gain increased confidence and knowledge. Get involved, ask questions, be proactive and find out how other people do things. Favourite event? My favourite non-match day event was definitely an Edgeware product Launch for Wilkinson's Sword and Hawaiian Tropic last Septmeber. This saw the client bring in Giant deckchairs as props, create a beach bar type cocktail area and perfume the room with their product scents. It definitely wasn't your standard conference and they had a full bespoke menu to add to the day. This involved no menu items being what they seemed and all items which you would expect to be savoury were sweet and vice versa. We had burgers made out of cake, ice cream cones with whipped goats cheese, and pea and mint cupcakes. The best bit was creating a dessert garden out of sweet treats and cakes, which was amazing! The event allowed all departments to be inventive and think outside the box a little. I loved the innovative idea and this creative side added an exciting edge to the event. I think the Sevens weekend was probably my favourite Match Day to work. I worked the weekend with Retail team overseeing the retail operation, food units and public bars. This gave us much to react to over the course of the weekend, and there was always different things to deal with. I really enjoyed being able to apply myself to issues which arose in this department. Have you got a favourite space? My favourite space is 100% the England Changing Rooms and the Players Tunnel. They are just such atmospheric spaces to hold an event in - especially if you're a rugby fan! I was shocked when I found out we can host dinners in the Changing Rooms but after seeing one take place, I could not have been more amazed. Being pitch-side still takes my breath away as well, it's amazing how different the stadium feels when its completely empty compared to 82,000 rugby fans. Any advice for students who are considering a placement? DO IT! Coming on placement to Twickenham is the BEST thing I have done. It's taught me so much, both about myself and the industry. The range of experiences are vast, you learn so much from the amazing people here and opportunities are in abundance. Originally, I wasn't sure the venue side of events was for me, but now I don't think I'd want to be anywhere else. Gaining experience in a major UK sporting venue and also within Compass Group has given me so much more confidence in the work I do, and now I can't wait to finish University and get back to work! I am motivated, prepared and so thankful for the opportunity!